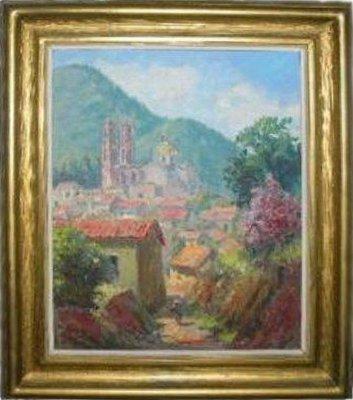 This is a wonderfully executed Impressionist painting of a scene of Taxco, Mexico, the silver capital of Mexico. Painted in Mexico in the early 1940's, the original owners were intrigued with its style and rich pallete and purchased it in Mexico before bringing it back to the United States. It has had only one owner before being acquired by the Club.